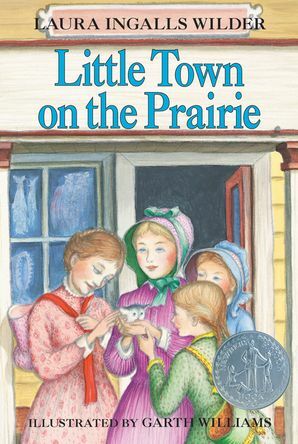 Based on the real-life adventures of Laura Ingalls Wilder, Little Town on the Prairie is the seventh book in the award-winning Little House series, which has captivated generations of readers. This edition features the classic black-and-white artwork from Garth Williams. In Little Town on the Prairie, the young town of De Smet has survived the long, harsh winter of 1880-1881. With the arrival of spring comes invitations to socials, parties, and “literaries.” Laura, who is now fifteen years old, attends her first evening social. In her spare time, she sews shirts to help earn money to send Mary to a college for the blind. Laura also receives her teaching certificate and can work at a school. And, best of all, Almanzo Wilder asks permission to being walking her home from church. Life in the little town certainly is exciting! The nine books in the timeless Little House series tell the story of Laura Ingalls Wilder’s real childhood as an American pioneer and are cherished by readers of all generations. They offer a unique glimpse into life on the American frontier and tell the heartwarming, unforgettable story of a loving family.